Colorado has some of the best road bike and mountain bike hill climbs. 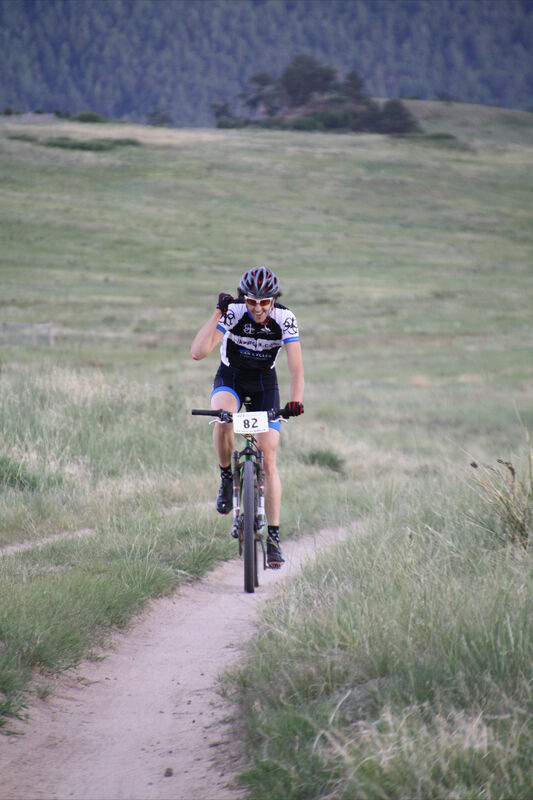 Additionally, there are countless rides and events like Ride the Rockies, Leadville100, and the Colorado Summit Cycling Series that challenge riders to either push on or blow up. No doubt the suffering imposed by climbing may cause us cyclist to fret, but the the post, Why You Should Love Climbing, suggests otherwise. With that motivation, how can we learn to love climbing? Hill repeats are a foundation of any good training plan. Basically, the plan is to riding up the hill as hard as you can, recovering on the way back down and then doing it again. A good heart rate monitor and power meter can aid in bio feedback and motivation and help you to judge your effort better. However – remember that whilst power numbers respond immediately to increased effort, heart rate takes time to accumulate – so expect it to take a few minutes for your heart rate to reach your target zone. To sit or stand while climbing – that is the question. Actually, it depends on rider preference; however, we’ve found lighter riders prefer to stand while heavier riders prefer to sit. Regardless, you may want to train doing both. Opt to sit on one climb or hill repeat, then stand on the next. Testing the limits of your ability to climb in both positions will make you a stronger all-around climber. Obviously while climbing, you are excepting more effort. That requires more oxygen. So, a simple way to to maximizing your oxygen uptake is learning to take deep breaths. Avoid shallow ones and breathe to your belly. This may require you to straighten up to allow your belly and ribs to actually expand. Given your bike fit, you may or may not need to adjust bike parts so be mindful of your body position when climbing so that you can inhale for optimum oxygen intake. Gears can be a complicated thing. In fact, many people buy a road bike or mountain bike and never modify their gears. Yet, depending on the climbs you are doing and your aspirations, you may consider swapping the cassette or chainset. If you’re struggling to turn the pedals on the climbs, changing your gear set up – going for a smaller chainset and wider ratio cassette – will help as you’ll be able to spin more quickly. A deathtrap on the handlebars, swinging your body around, and tense muscles make climbing much more difficult. Also, it’s a waste of precious energy! Just relax! Find your rhythm and get into a groove that you can sustain. Pick one or all of these tips and try them out. Give yourself some time to evaluate your progress. At Peak Cycles Bicycle Shop, our bet is after a few weeks of one or all of using these tips, you’re climbing performance will increase. Whether or not you actually fall in love with climbing is another matter – but at least you will be better at it! For some, the Colorado road racing season has already started; however, for many, it is just around the corner and many athletes may be pondering which tours and races to plan for in 2013. Whenever you want to achieve something, you have to have a definite goal. As such, it’s important to plan your season right. Whether you are a casual rider or a competitive cyclist, training, racing, recovering and having the appropriate gear, tools, and bike setup are critical to reaching your goals. For starters, what are you’re 2013 cycling goals? As mentioned in our recent blog post, it’s important to make your goals SMART. As in, specific, measurable, attainable, realistic and time-bound. With that being said, Colorado offers world class riding and racing. Now that you are thinking about what your goals are, you need to pick the right events during the cycling season to help you best achieve those goals. Notably, not all events are equal. Some are harder than others and as such, competitive cyclist can use different course profiles, distances, and bike part options to mindfully select A, B, and C type races according to their training plans and race goals. When you’re working toward a goal that’s important to you, the last thing you want is to face an obstacle or unexpected challenge. A successful season starts off right by planning ahead, getting your road bike in order and getting the gear and resources you need. By selecting the best races based on your specific goals and having the best bike parts associated with your riding style, you are successfully preparing for a rewarding 2013 cycling season. The Koppenberg May 5, 2013 The Koppenberg race featuring a 17% grade climb is the queen of the spring time cycling events in Colorado. Elephant Rock Cycling Festival: May 31–June 2, 2013 This year’s Elephant Rock Cycling Festival notes the 26th annual pilgrimage to Castle Rock for the Rocky Mountain region’s premier cycling festival. Riders of all ages turn out for this event. Ride the Rockies June 8 – 15, 2013 The 28th annual tour will feature 3 scenic mountain passes, a trek over the highest suspension bridge in the U.S. and 20,400 vertical ft. over 7 days and 513 miles. Coldwell Banker Denver Century Ride June 15, 2013 The Denver Century Ride features bicycle courses for all skills levels and benefits BikeDenver. This healthy lifestyle cycling event is Colorado’s premier urban bicycle ride and is open to the public. Mount Evans Hill Climb: July 2013 Race up 7,000 feet in elevation in just 28 miles on the Mount Evans Scenic Byway. Triple Bypass July 13 – 14, 2013 A two day ride from Evergreen to Avon. Copper Triangle August 3, 2013 The Copper Triangle is a 78-Mile course with an elevation gain of almost 6,000 feet over three mountain passes. It has has long been considered one of Colorado’s classic alpine road rides Graced with breathtaking scenery, gorgeous roads and three challenging climbs. Not sure which event is for you? Stop by the Peak Cycling Bike Shop for help or visit us at bike parts.com for maps, information, or general bike components that you may need for your next big event. The holidays have passed, the New Year has come and gone, and now, the 2013 Ride and Race Season planning is underway. Whenever you want to achieve something, you have to have a definite goal. As such, it’s important to plan your season right. Whether you are a casual rider or a competitive cyclist, training, racing, recovering and having the appropriate gear, tools, bike setup to reach your goals is critical. How do you plan to train? Riding in cooler temps and shorter days tugs at motivation. However, having a few rides and races on your radar can help you maintain determination. Remember, buddying up, eating well, or even joining us for our local shop ride in Golden, Colorado can help build training momentum. Is your bike ready? Our post, Winterizing Your Bike: What’s In Your Tool Kit? offers some great tips for bike maintenance during winter riding. But is your bike set for the 2013 season? Do you need a new bike or maybe even need to replace old bike parts? Sometimes getting a bike fit can help better position you for a season of successful riding. When you’re working toward a goal that’s important to you, the last thing you want is to face an obstacle or unexpected challenge. Set up your 2013 right by planning ahead, getting your road bike or mountain bike in order, and getting the gear and resources you need. With the right mental attitude and the best bike parts, your successful training and race prep is well underway.